It is with the greatest of sadness, that I inform you of the passing of our dear friend, 'Uncle Barry' Hutchins (aka Airgunner). Barry was admitted into Hospital recently, but his condition rapidly worsened, and he passed away, peacefully, and comfortably, late last Saturday night, surrounded by his family. It was the request of Barry's family that news of his passing was not made public immediately, and out of respect for their wishes this very sad news was keep secret, but now they feel the time is right to let all his many many friends know. Barry was a very well liked, nay loved, and highly respected member of many airgun forums, and had made many friends along the way, and so will be very very sadly missed. So I'm sure you'll want to join me in sending your deepest condolences to Barry's family, and friends. R.I.P Uncle Barry, we'll never forget you. Yes, I was very sorry to hear that, shocked even! My sincere condolences to Barry's Family and all his friends at this difficult time, he will be missed by many, characters like him leave a void in peoples lives. RIP Barry! horrible news. tears in my eyes . he was one of the worlds truest gents. he will be greatly missed by a lot of folk. goodbye my friend and sleepwell. 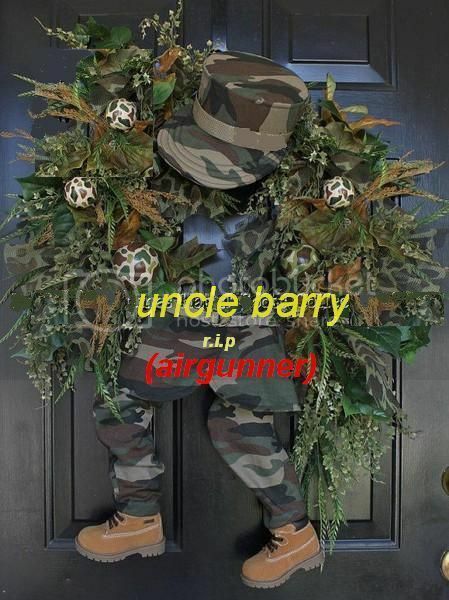 god bless you UNCLE BARRY R.I.P. The world in general and the world of Airgunning has lost a Real gentleman, I was fortunate to meet Barry at the AGU Meet's and the last Planet meet up . I type this with a tear in my eye and say farewell Barry you will be greatly missed. My thought's are with his family too. Very sad news - rest in peace Mr H ! T'is a sad day (Barry if your out there, can you please pay a visit to those who scam/bring give our sport a bad name and scare the life out of them) I vote we make Barry yhe patron saint of airgunning! For every airgunner that's cut down in there prime, two should be nourished in the ways of the airgun!